Objective To examine the nature of media coverage of vitamin D in relation to its role in health and the need for supplements. Setting Print articles from elite newspapers in the UK, the USA and Canada. Participants 294 print newspaper articles appearing over 5 years (2009–2014). Results Newspaper coverage of vitamin D generally supported supplementation. The most common framing of vitamin D in print articles was “adequate vitamin D is necessary for good health.” Articles also framed vitamin D as difficult to obtain from food supply and framed vitamin D deficiency as a widespread concern. In discussions of supplementation, 80% articles suggested supplementation is or may be necessary for the general population, yet almost none of the articles discussed the potential harms of vitamin D supplementation in any detail. Print articles named 40 different health conditions in relationship to vitamin D. The most commonly cited conditions included bone health, cancer and cardiovascular health. Although print articles referred to a wide range of scholarly research on vitamin D with varying degrees of endorsement for supplementation, a general tone of support for vitamin D supplementation in media coverage persisted. Conclusions Newspaper articles conveyed overall support for vitamin D supplementation. News articles linked vitamin D to a wide range of health conditions for which there is no conclusive scientific evidence. Media coverage downplayed the limitations of existing science and overlooked any potential risks associated with supplementation. This study examines a large sample of print media articles from venues with high circulation rates. This study demonstrates that media coverage links vitamin D to a wide range of health conditions for which there exists no conclusive evidence. This study does not examine internet-based news sources, which are becomingly an increasingly important source of health information. The reasons people take supplements are undoubtedly complex and multifactorial11 and are set within the current cultural context that emphasises the importance of actively taking personal responsibility for one's health.12 ,13 In order to successfully manage one's health, it has been suggested that the ‘citizen-come-consumer’ (ref. 12, p.356) is compelled to make consumer choices that both demonstrate one's commitment to improving one's health and promise to minimise health risks. Given the popularity and health implications of vitamins and supplements, an analysis of news media representations may provide valuable insights that could inform future approaches to public, patient and health professional education. 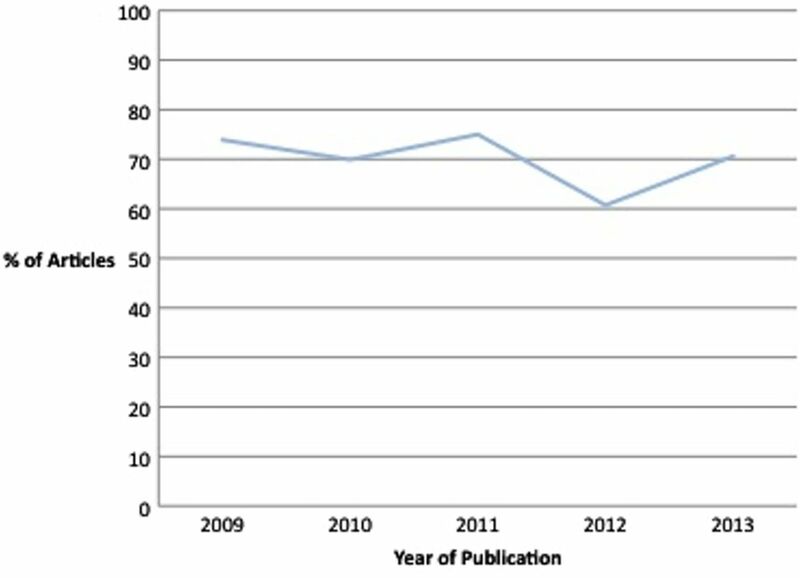 While researchers have previously examined and critiqued the misrepresentation of health-related issues in the popular media24 ,25 and some research has been conducted on portrayals of dietary supplements in magazines26 and advertisements,27 there has, to date, been little analysis of news media coverage related to the value of vitamins or supplements. As such, this study provides a systematic analysis of how one of the most widely consumed supplements, vitamin D, has been portrayed in the popular press and identifies the dominant messages conveyed around vitamin D, health and the need for supplementation. Vitamin D has received a great deal of attention in the popular press over the past few years. Headlines have, for example, declared a “‘Plethora’ of diseases caused by vitamin D”28 and that increased vitamin D supplementation/fortification “could stop ‘modern’ diseases.”29 However, the state of the existing evidence around the health benefits of vitamin D supplementation is best described as unsettled.30 ,31 A recent trial sequential meta-analysis32 reported on the results from 40 randomised controlled trials (roughly 100 000 patients) of vitamin D supplementation alone or vitamin D plus calcium. Most studies followed participants for at least 1 year and in some cases for up to 5–7 years. When looking at the important clinical end points of myocardial infarction or ischaemic heart disease, stroke or cerebrovascular disease, cancer, and mortality, vitamin D supplementation did not significantly reduce risk of these outcomes. Vitamin D supplementation combined with calcium did show a statistically significant reduction in total fractures (8% relative reduction). There were also no reported negative outcomes associated with supplementation in these studies. The authors concluded, “Available evidence does not lend support to vitamin D supplementation and it is very unlikely that the results of a future single randomised clinical trial will materially alter the results from current meta-analyses” (ref. 32, p.318). These findings provide some support for vitamin D combined with calcium for reducing fracture risk, but suggest other health claims associated with vitamin D supplementation are not currently supported by the literature. For the purposes of our study, we do not need to take a stand on the value of vitamin D supplementation; as this is a complex issue (involving biomarkers and the multiple functions of vitamin D in the body and through the lifecycle). We also do not address the use of vitamin D for specific, vulnerable populations41 or those that clearly have vitamin D status that would be associated with important health outcomes like rickets. Instead, we merely seek to highlight that even a cursory review of the relevant academic literature reveals the science around the evidence that the population requires vitamin D supplementation for optimal health and prevention of diseases is far from conclusive. The evolving and conflicting nature of the relevant scientific research, outlined briefly above, the absence of research that examines media representation of vitamins and supplements, and the substantial media coverage on vitamin D present a timely opportunity to explore the nature and tone of the media attention paid to this popular vitamin supplement. Our study sought to understand how the news media framed vitamin D supplementation and whether the framing changed over a 5-year period. Our study was modelled after previous studies that took an inductive approach to analysing the content of print news media;24 ,25 we conducted a content analysis of print articles appearing in elite newspapers that addressed vitamin D over a 5-year period (2009–2014). Search terms included: ‘vitamin D’ and ‘health’. The Factiva database was used to collect newspaper articles about vitamin D in elite newspapers in Canada, the USA and the UK. The search was limited to the top five daily newspapers in a broadsheet format in each country based on recent circulation reports.42 ,43 Our initial search yielded 408 results. Articles were excluded from analysis if vitamin D was not linked to discussions of health or supplementation, or if vitamin D was not a general focus of the article. Our final data set consisted of 294 newspaper articles published between January 2009 and January 2014. Exploratory qualitative coding was initially conducted on a random sample of 40 articles (approximately 10%) from the entire sample.44 Based on recurring themes that emerged during initial qualitative coding, a coding instrument was developed which was organised into three sections. The first section included general, descriptive information about the publication. The second section captured the health conditions discussed in relation to vitamin D, whether vitamin D supplementation was mentioned and/or recommended, whether the article referred to a specific research study about vitamin D and the extent of the information provided, and whether the potential harms of vitamin D supplementation were discussed. Finally, each article was coded as being overall supportive of, skeptical of, merely descriptive or as presenting multiple perspectives on vitamin D supplementation. For the purposes of this study, these items were considered important elements in the framing, or central organising ideas, of representations of vitamin D supplementation in news media. Our results suggest that vitamin D garnered considerable media attention over the 5-year period of interest. Vitamin D coverage peaked in 2010 (which may have been influenced by the release of the revised vitamin D recommendations by the IOM in November 201033), and showed only a slight decline in subsequent years. While newspaper coverage was most prominent in Canada, media attention was fairly evenly distributed between all three countries, as shown in table 1. The largest number of newspaper articles were featured in health and lifestyle sections (48%), followed by the news and front-page sections (31%). What's the big deal about D? Our content analysis revealed the major themes used in media coverage of vitamin D. In general, articles frequently identified and exalted vitamin D's role in maintaining or promoting good health and in preventing chronic disease. The most common theme overall was: “adequate vitamin D is necessary for good health” (57% articles). Most articles contained several themes. Other major themes included, “vitamin D supplements may be necessary for good health and the prevention of chronic disease” (36% articles), “it is impossible or difficult to get vitamin D from natural sources” (28% articles) and “vitamin D deficiency is widespread and cause for concern” (30% articles). Overall, the themes in news articles positioned vitamin D as important for good health, but also suggested it is difficult to achieve sufficient vitamin D levels without supplementation, and that deficiency is a widespread concern. Articles were also coded to identify the specific health conditions linked to vitamin D. In total, newspaper articles named 40 different health conditions associated with vitamin D. Overall, cancer was mentioned most frequently (43%), followed by bone health (39%). After cancer and bone health, newspaper articles cited multiple sclerosis (MS) (28%), cardiovascular health (25%) and diabetes (24%) most frequently. Interestingly, these conditions varied slightly by year, as shown in figure 1, but cancer and bone health remained relatively steady. Most frequently named health conditions discussed in relationship to vitamin D in newspapers over 5 years. Although these were the most frequently mentioned health concerns, vitamin D was credited for preventing or decreasing the risk of a vast array of health conditions ranging from hair loss, influenza, the common cold, Parkinson's disease and for assisting with muscle recovery. Furthermore, the majority of articles (88%) listed more than one health concern in connection to poor vitamin D status. As a result, an overarching narrative emerged that celebrated vitamin D as a wonder drug that is ‘good for everything’. In light of the zeal with which the North American population purchases and consumes vitamin supplements, and given the media's emphasis on vitamin D's role in a wide range of health conditions, we examined how media coverage addressed the specific issue of vitamin D supplementation. Our analysis revealed 86% of newspaper articles explicitly referred to vitamin D supplementation. Of these, 59% of newspaper articles suggested ‘supplementation may be necessary for good health’ while 21% more assertively declared ‘supplementation is necessary for good health’. In other words, 80% of newspaper articles suggest supplementation is or may be necessary (figure 2). Percentage of articles that utilised one or both of the frames ‘supplementation may be beneficial’ and/or ‘supplementation is necessary’ by year. It is important to note, however, some newspaper articles, although supportive of vitamin D supplementation overall, were moderate in their approach. For example, 25% of articles suggested that more research is needed before unequivocal guidance around supplementation is possible. Some articles (8%) also made mention of the potential harms of too much vitamin D.
Importantly, many newspaper articles utilised the inverted pyramid style,46 which often puts more detailed information, such as the potential for harm further down in the article. We coded for the tone of the entire article, but it may be that if audiences read only the first part of the article, they may not read the more nuanced, detailed pieces of information included in the article. We also sought to identify if vitamin D daily intake recommendations for the general public were attributed to any expert, professional or governing body, and if so, which one. Of the newspaper articles (53%) that provided these recommendations for the general public, 58% of articles failed to attribute the recommended intake to any expert body. Of those articles that did provide recommendations and attributed them to a professional body, IOM was the most frequently cited (13%), followed by Health Canada and the Cancer Society of Canada (10%). Many articles suggested that obtaining vitamin D through dietary means and sun exposure was preferable to supplementation, and 57% of articles identified one or more dietary sources of vitamin D, such as fortified milk and some fish. However, articles simultaneously reminded readers that sufficient vitamin D is difficult to obtain through these non-supplementary means; indeed, this was one of the primary themes about vitamin D aforementioned. Therefore, although articles often acknowledged that non-supplementary sources of vitamin D were preferable, they also indicated that this approach would likely fail to meet recommendations. As a result we interpreted these discussions as contributing to general support for supplementation. Deciphering the science: accurate messages in the news? The ongoing scientific research on vitamin D was reflected and, at times, explicitly noted in the news media coverage. Of the articles that discussed supplementation, 40% of newspaper articles referred to one or more specific scientific research studies (ie, a peer-reviewed journal article) on vitamin D. These studies were positioned as ‘evidence’ around vitamin D supplementation and vitamin D's role in specific health conditions. In addition, 35% of newspaper articles provided details that extended beyond the study's overall conclusions (ie, type of study, sample population and size). We also coded articles to assess whether news articles interpreted the research as an endorsement of vitamin D supplementation. Our results showed 56% of those newspaper articles that mentioned research did not interpret the research as taking an explicit stand one way or the other on supplementation. However, 22% of the articles that mentioned research did interpret the research as an endorsement of supplementation. Given the ongoing scholarly debate surrounding vitamin D, we analysed these data to identify any potential change in how the science was positioned over the 5-year sample period. We found the interpretation of research as endorsement of vitamin D supplementation dropped noticeably in 2012 as seen in figure 3. This may reflect the increasing number of research studies that do not call for or support supplementation, or a more cautious approach to interpretation on part of the news media. However, despite this decline in referencing scientific support for supplementation, articles maintained a supportive tone in favour of supplementation overall. 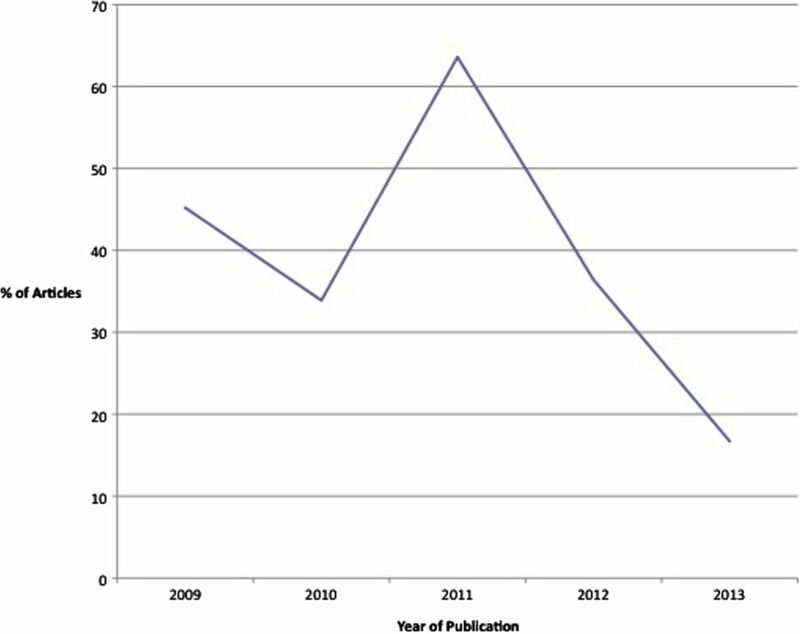 Percentage of articles citing research about vitamin D that interpreted research as endorsement of supplementation by year. Third, despite the equivocal nature of scientific evidence, even on frequently studied outcomes such as cancer, fractures, cardiovascular health and all-cause mortality,32 ,36 ,37 media coverage overall suggested an established link between vitamin D and multiple health conditions beyond these. However, potential harm of excessive vitamin D levels and supplementation was very rarely discussed. Therefore, vitamin D supplementation was constructed as risk-free and as providing myriad potential health benefits. We know the media is a powerful, persuasive source of health information.51 ,52 Given our findings that the popular press has been consistently endorsing supplementation, it seems reasonable to conclude the popular press is, at least in part, helping to fuel the demand for vitamin D supplements and to the confusion about its value. This framing of vitamin D supplementation may be interacting with salient ideas about the need to take responsibility for one's health, which is often demonstrated through consumer behaviour and other health-related decisions.12 ,13 However, the actual impact of media on public perceptions was beyond the scope of this study and could be the subject of future research. Our study also highlights the need for good, independent and reliable sources of health information that present a more nuanced and contextualised picture of the relevant science. Therefore, future research should examine how vitamin D is represented in social media and on popular health-related information websites to determine how the general public integrates and makes sense of these diverse sources of information. It would also be important to examine the public's perceptions of the relationship between vitamin D and health and their beliefs about supplementation. Bennett and colleagues50 provide an important starting point and future research could examine more explicitly what messages the general public takes home from media coverage of vitamin D. Finally, future research that captured the perspectives of health professionals would be important. This research was generously supported by the Trudeau Foundation and the Canada Research Chairs Program. The authors would like to thank Brice Goldfeldt and Frances Wallace for their assistance in coding the data, Sean Stolp for his assistance with analysis, Kalina Kamenova for her contribution to the coding framework, and the University of Alberta's Health Law Institute for administrative support.
. Oral high-dose multivitamins and minerals after myocardial infarction: a randomized trial. Ann Intern Med 2013;159:797–805.
. Antioxidant supplements for prevention of mortality in healthy participants and patients with various diseases. Cochrane Database Syst Rev 2012;3:CD007176.
. The new public health: discourses, knowledges, strategies. Thousand Oaks: Sage, 1996.
. Media discourse and public opinion on nuclear power: a constructionist approach. AJS 1989;95:1–37.
. ‘Plethora’ of diseases caused by low vitamin D. The Telegraph 12 December 2012.
. Vitamin D—could it stop ‘modern’ diseases? The Telegraph 10 March 2014.
. The coding manual for qualitative researchers. 2nd edn. Los Angeles: Sage, 2013.
. Drugs in the news: an analysis of Canadian newspaper coverage of new prescription drugs. CMAJ 2003;168:1133–7.
. Use of social media and internet to obtain health information by rural adolescent mothers. Appl Nurs Res. 2014 (cited 20 July 2014). http://www.appliednursingresearch.org/article/S0897-1897(14)00087-1/pdf. Contributors TC conceptualised the study and assisted with analysis. MC collected, coded and contributed to analysis. CR contributed to analysis. TC, MC, JPM, CR and CJF reviewed data and contributed to writing the manuscript. Data sharing statement Data set consisting of coded articles available on request from the corresponding author Tim Caulfield; caulfield@ualberta.ca.